Vikrant Rathod lives at the construction site of Mayur Kilbil in Dhanori. Vikrant's family migrated to Pune from Pusad in Yavatmal in 2011. Door Step School staff helped him get enrolled in nearby government school in the same year. Vikrant started attending the school in 4th standard and now he has reached the 7th standard. He enjoys attending school just as much as he did when he got the admission. Vikrant also appeared for the scholarship exam in the 4th standard. Vikrant’s school timings are from 7am till 12pm. However, he wakes up at 4am to help his mother. 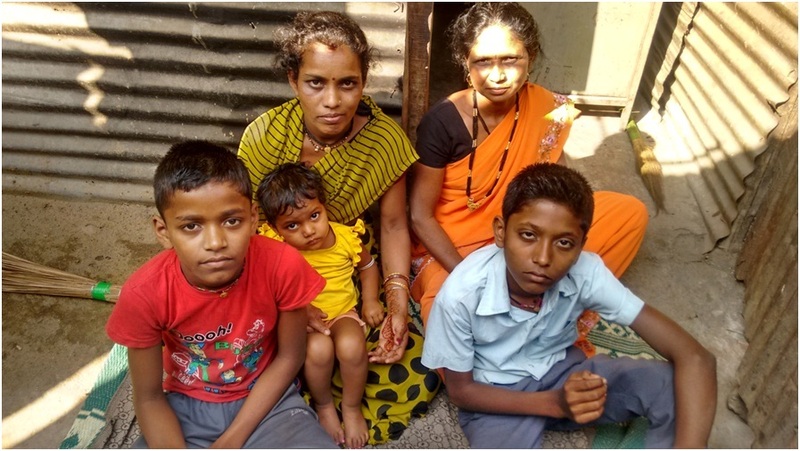 His mother, Varsha Rathod told us that they did not enrol Vikrant in any school earlier just because of their lack of awareness about importance of education and about the admission process. Varsha works as a maid at various households nearby. Her working hours are from 6am till 2pm. She explained that they have determined to work at places near the school as she does not want her son to miss out on his education. She has decided to support him in any career choice he wishes to make. Vikrant wants to be a pilot when he grows up. She said that she had attended a few parent teacher meetings earlier, but her son manages well now and she doesn’t find the need to go to his school any more. Vikrant even spoke a few sentences about his family in English as his mother watched proudly. Vikrant has a younger sister about 6 years old who also wants to go to school with him, and very soon she will too. His mother said that although she has spoken to other parents about sending their children to school, they are unwilling since they feel that the roads are very dangerous for the children to go to school. She claims that it is okay even if they die, but education should not be compromised in any case. Till 7th standard, Vikrant attended a government school, but now he will have to attend a private school. His mother says that she will pay the fees but will not let his education stop. As the school is far from their place, he will go to the school on a bicycle. His mother is very thankful to Door Step School for helping them start education of Vikrant. Vipul Rathod is Vikrant's cousin. His family also stays at the same construction site, Mayur Kilbil in Dhanori. Vipul was 11 years old when he started schooling. Currently he is in the 8th standard. He loves going to school and told us that the school teachers teach very well. He wants to become a police officer when he grows up. He says that he studies at home as well. He appeared for the scholarship exam this year. His mother works as a maid and his father works on the construction site.